, commonly called “The holyMaid of Kent,” a religious impostor in the reign of Henry VIII. was a servant at Aldington in Kent, and had longbeen troubled with convulsions, which distorted her limbs and countenance, and threw her body into the most violent | agitations; and the effect of the disorder was such, that, even after she recovered, she could counterfeit the same appearance. Masters, the minister of Aldington, with other ecclesiastics, thinking her a proper instrument for their purpose, persuaded her to pretend, that what she said and did was by a supernatural impulse, and taught her to act her part in a manner well calculated to deceive the public. Sometimes she counterfeited a trance; then coming to herself, after many strange contortions, would break out into pious ejaculations, hymns, and prayers, sometimes delivering herself in set speeches, sometimes in uncouth monkish rhymes. She pretended to be honoured with visions and relations, to hear heavenly voices, and the most ravishing melody. She declaimed against the wickedness of the times, against heresy and innovations, exhorting the people to frequent the church, to hear masses, to use frequent confessions, and to pray to our lady and all the saints. All this artful management, together with great exterior piety, virtue, and austerity of life, not only deceived the vulgar, but many far above the vulgar, such as sir Thomas More, bishop Fisher, and archbishop Warham, the last of whom appointed commissioners to examine her. She was now instructed to say, in her counterfeit trances, that the blessed Virgin had appeared to her, and assured her that she should never recover, till she went to visit her image, in a chapel dedicated to her in the parish of Aldington. Thither she accordingly repaired, processionally and in pilgrimage, attended by above three thousand people and many persons of quality of both sexes. There she fell into one of her trances, and uttered many things in honour of the saints and the popish religion; for herself she said, that by the inspiration of God she was called to be a nun, and that Dr. Bocking was to be her ghostly father. 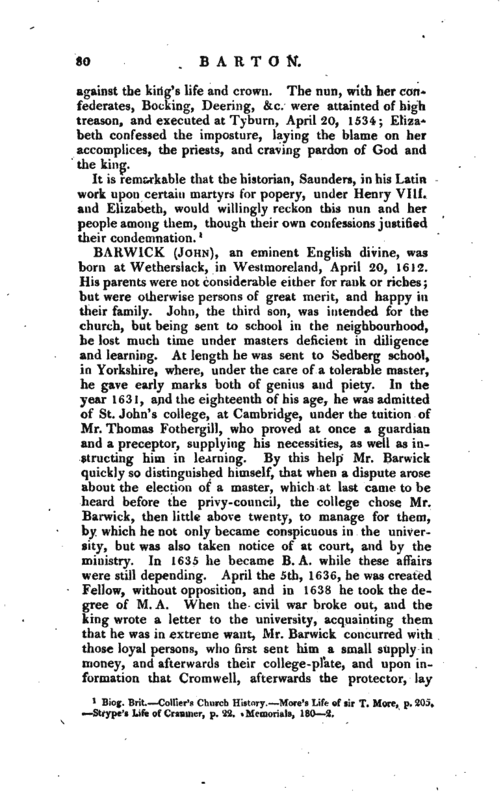 This Dr. Bocking was a canon of Christ church in Canterbury, and an associate in carrying on the imposture. 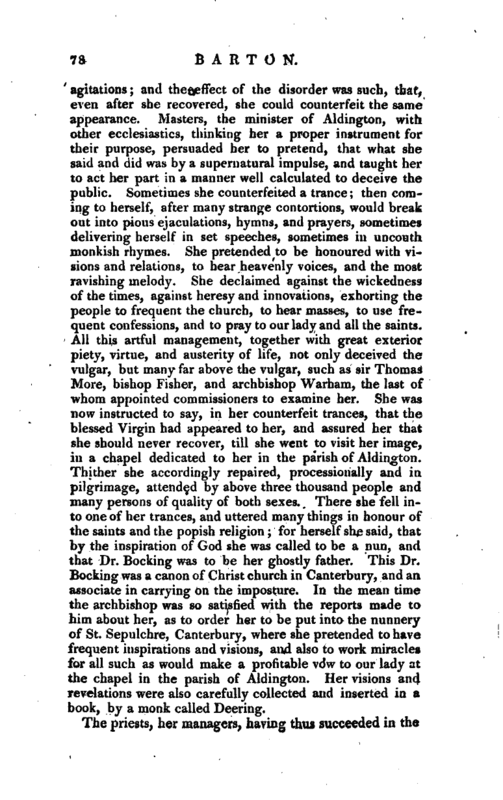 In the mean time the archbishop was so satisfied with the reports made to him about her, as to order her to be put into the nunnery of St. Sepulchre, Canterbury, where she pretended to have frequent inspirations and visions, and also to work miracles for all such as would make a profitable vow to our lady at the chapel in the parish of Aldington. Her visions and revelations were also carefully collected and inserted in a book, by a monk called Deering. The priests, her managers, having thus succeeded in the | imposture, now proceeded to the great object of it; Elizabeth Barton was directed publicly to announce, howGod had revealed to her, that “in case the king should divorce queen Catherine of Arragon, and take another wife during her life, his royalty would not be of a month’s duration, but he should die the death of a villain.” Bishop Fisher, and others, in the interest of the queen, and of the Romish religion, hearing of this, held frequent meetings with the nun and her accomplices, and at the same time seduced many persons from their allegiance, particularly the fathers and nuns of Sion, the Charter-house, and Sheen, and some of the observants of Richmond, Greenwich, and Canterbury. 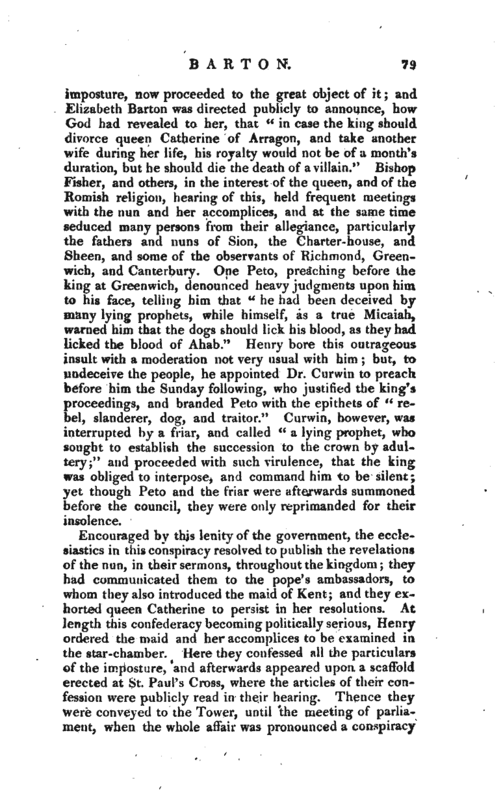 One Peto, preaching before the king at Greenwich, denounced heavy judgments upon him to his face, telling him that “he had been deceived bymany lying prophets’, while himself, as a true‘ Micaiah, warned him that the dogs should lick his blood, as they had licked the blood of Ahab.” Henry bore this outrageous insult with a moderation not very usual with him; but, to undeceive the people, he appointed Dr. Cunvin to preach before him the Sunday following, who justified the king’s proceedings, and branded Peto with the epithets of “rebel, slanderer, dog, and traitor.” Cur win, however, was interrupted by a friar, and called “a lying prophet, who sought to establish the succession to the crown by adultery;” and proceeded with such virulence, that the king was obliged to interpose, and command him to be silent; yet though Peto and the friar were afterwards summoned before the council, they were only reprimanded for their insolence. Encouraged by this lenity of the government, the ecclesiastics in this conspiracy resolved to publish the revelations of the nun, in their sermons, throughout the kingdom they had communicated them to thepope’s ambassadors, to whom they also introduced the maid of Kent; and they exhorted queen Catherine to persist in her resolutions. At length this confederacy becoming politically serious, Henry ordered the maid and her accomplices to be examined in the star-chamber. Here they confessed all the particulars of the imposture, and afterwards appeared upon a scaffold erected at St. Paul’s Cross, where the articles of their confession were publicly read in their hearing. Thence they were conveyed to the Tower, until the meeting of parliament, when the whole affair was pronounced a conspiracy | the king’s life and crown. The nun, with her confederates, Bocking, Deering, &c. were attainted of high treason, and executed at Tyburn, April 20, 1534; Elizabeth confessed the imposture, laying the blame on her accomplices, the priests, and craving pardon of God and the king. Biog. Erit. Collier’s Church History. More’s Life of sir T. More, p. 205. —Strype’s Life of Cranmer, p. ’22. 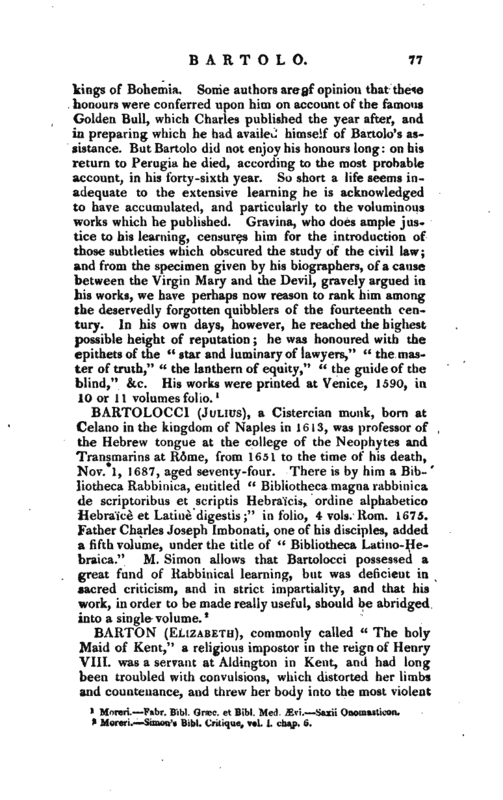 Memorials, 1802.